This article is from the Tea & Coffee Trade Journal (Sept '06). This publication contains many interesting articles on both tea and coffee. It is a great place to learn about tea and the growing regions. Loved by tea connoisseurs for its rich and varied flavors, oolong tea is going mainstream, as consumers learn more about the diverse types of specialty teas available to them.. Although oolong tea is produced in a growing number of countries, such as Vietnam and India, its home is in the Fujian province of Southeastern China. According to sources in both Chinese and English, tea was first produced from oolong varietals as early as the Song Dynasty (960-1279), during which it was listed as a tribute tea in official records. However, the methods for processing partially-oxidized oolong tea did not become prevalent until the Ming Dynasty (1368-1644), at about the time the famed Yixing teapot came into being - regarded by many as the most suitable vessel for brewing oolongs. Today, oolong is produced in China’s Fujian and Guangdong provinces, as well as in Taiwan. Oolong tea is classified in the west as semi- or partially-oxidized tea, in contrast to green tea, which is unoxidized, and black tea, which is fully oxidized. In China and Taiwan, when tea professionals use the word oolong, they are generally referring to a varietal or cultivar of camellia sinensis. When they speak of partially-oxidized tea, they usually refer to it as qing cha. To understand oolong teas better, an important first step is to know how they are processed, and how differences in processing result in different flavor profiles. The making of oolong tea is considered among the most difficult of tea processing methods, since it includes many steps and requires a great deal of precision and expertise. For example, if too much moisture is left in the leaves, the tea may have a moldy character. If the tea is baked at too high a temperature, it can taste burnt. The processing of oolong tea requires about 10 steps, beginning with the plucking of the leaves, either by machine or hand. The best oolongs include the top two leaves and the bud, while those of lesser quality may have more leaves and may not include the bud. In order to reduce the level of moisture in the leaves, they are then spread in a thin layer on a large tarp to wither outside in the sun. Depending on the intensity of the sunlight and temperature, solar withering lasts from 30 minutes to one hour. If it is foggy or misty, the tea may be taken into a greenhouse to wither. Left: Author with industrious women sorting. Right: Preparing to mass roll and shape Oolong. After the withering in outside temperature is complete, the tea is brought indoors for additional withering and oxidization. Depending on the type of oolong tea, the leaves are mixed and turned, approximately every two hours for a period of 8-10 hours, in order to be evenly oxidized. It is helpful to think of oxidation as a continuum, ranging in degrees from zero to 100%, where partially-oxidized oolong teas fall between 15-70% oxidation. The fourth step is to pan fire the leaves, which slows the pace of oxidation and begins the drying process. According to Jackson Huang, former chairman of the Taiwan Tea Manufacturers Association, about 50% of the moisture remains in the leaves at this point, compared to about the 75% that was present prior to processing. After pan firing, the leaves are rolled around in a machine that lightly crushes them, releasing juices that contribute to the flavor and aroma of the finished tea. After the leaves are rolled, they are separated and dried. At this point, the basic process of making oolong tea diverges, according to the type of tea being made. For example, when making Oriental Beauty oolong (also known as Champagne Oolong, Formosa Oolong, Baihao Oolong, etc. ), the leaves are wrapped in a damp cloth before they undergo final drying. Baozhong tea (Pouchong) is dried completely after rolling, and baked for a short time at a low temperature to insure that the moisture level is no more than 3-5%. Other oolongs, such as Tie Guan Yin (also Iron Goddess, Ti Kwan Yin), Tung Ting (Dong Ding), and High Mountain Oolong (Gaoshan Oolong), are dried partially and then shaped into balls, during a process in which the leaves are wrapped tightly in a cloth ball, and the balls of leaves are rolled in a machine usually three at a time (formerly, the balls were rolled by foot). The leaves are then removed from the cloth and tumbled in a cylindrical drying machine on low heat to separate the clumps of leaves. This step is repeated as much as 32 times, for over a period of eight hours. All the tea is subjected to final drying, regardless of differences in the steps taken after rolling. 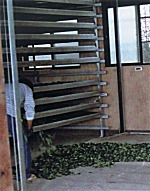 Drying is then followed by a refinement process, which includes sifting and sorting the leaves by size, removing stems, and winnowing to remove debris. Although machines carry some of these steps out, there are others that are performed by people. For some teas, there is an additional baking step, which results in what is now often referred to as Amber Oolong. This is associated with the traditional flavors of oolong tea produced in China. Traditionally, the tea was baked in bamboo baskets over charcoal, but now electric heat is often used instead. Since baking time and temperature determines the final taste of the tea, this results in a spectrum of different taste profiles, such as the lighter, aromatic flavors of Taiwan’s High Mountain Oolongs, the complex richness of Tie Guan Yin, and the heartiness of Fo Shou (Buddha’s Palm). In China, there are many types of varietals used to make oolong teas that are not found in Taiwan (too many to mention here). China oolongs are traditionally oxidized more and baked longer at higher temperatures than Taiwan oolongs, yielding a rich, full-bodied tea with little astringency. The most famous mainland oolong teas are those from the Fujian province, which is the origin of the legendary Wuyi Rock or Cliff Teas (Wuyi Yan Cha or Yancha), where the tea plants grow on cliffs. According to the former Chinese Ministry of Agriculture official, Mr. Hu Zeng, many of these teas are extremely rare, with some of the tea gardens almost completely inaccessible. Famous Wuyi teas include: Xiao Hong Pao (Small Red Robe), Shuixian (Water Sprite), Rougui (Chinese Cassia), and Da Hong Pao (Big Red Robe). Of these, Da Hong Pao is probably the rarest, since the authentic it is made with leaves from just one ancient tea tree, so very little is produced each year. Each of these Wuyi teas is distinctive in terms of flavor, but overall the best of them can be described as mellow and rich, often with the aroma of orchids and an aftertaste reminiscent of ripe fruit or peach pits. Another famed mainland tea is Tie Guan Yin, which originates from Anxi County in Fujian. With a smooth, mellow flavor and golden-hued aromatic cup, this tea is a wonderful transition for those that wish to stop drinking coffee. Tie Guan Yin is usually made from the unit of the same name, but it can also be made from the qingxin oolong varietal. About 35-40% of the oxidized tea leaves from the Tie Guan Yin line are stronger and more pliant than qingxin. The leaves are rolled into a ball shape during processing, and then baked at medium-high temperatures to produce its well-known flavor characteristics. The Fenghuang Dancong (Phoenix Select) is made of leaves from single trunk trees grown on Phoenix Mountain in the Guangdong Province. Due to their height, pickers usually use ladders or climb the trees to pluck the leaves. The twisted leaves are a brownish color, which are capable of several aromatic infusions of amber-hued liquor. Some have an almost woody flavor, while others may be slightly bitter or astringent on the first infusion. Originally a repository of tea-making expertise from the Fujian province, Taiwan now stands on its own in terms of the quality and uniqueness of its oolongs. Although there is evidence of the existence of wild tea plants some 300 years ago, much of the tea that is produced there today are varietals that were brought from Fujian during the 19th century. The most prominent being Wuyi oolong, which was planted in central Taiwan, and Anxi tea varietals, which were planted in the North. 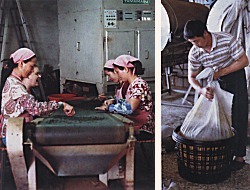 Traditional mainland oolong processing methods were used for many years. As Taiwan’s tea industry grew, tea makers refined their processing methods and produced several, new types of blends. Today, there are over 100 different varietals cultivated around the island, many of which are used to produce popular oolong-style teas e.g., Jinhsuen, a wide type of leaf that is often used for making High Mountain tea, and Szjichuan, which is used for many Jade Oolongs). Originally, most commercial tea was produced in northern Taiwan. The Wenshan Baozhong, for example, is known for its light infusion and floral aroma and aftertaste. It is grown in the hills northeast of Taipei, with long, twisted leaves that are only oxidized about 10-15%. Closer to Taipei, the hills of Maokung are known for production of Tie Guan Yin tea, sometimes scented with osmanthus flowers. Made in the Fujian style, this is a rich, flavorful tea with a sweet, lingering aftertaste. However, it is becoming more difficult to find, since according to former chairman, Huang and tea growers in Maokung, many tea farmers in this area are converting to coffee production. In the southwest region of Taipei, the exquisite Oriental Beauty is made. Using the qingxin dapan varietal, this tea -- unique to Taiwan -- is oxidized as much as 70%, yielding a medium-bodied liquor with a floral aroma and an intense, rich aftertaste of honey and peaches, popular with westerners who like the natural sweetness. While some lower grades may be baked, the best Oriental Beauty is not. Given the prices the Taiwan’s high mountain teas command, this comes as no surprise. Li Shan, Ju Shan, and Shanlinxi are homes to some of Taiwan’s most memorable teas, and at their best, these high mountain oolongs, grown at elevations of 3000-feet and higher, have a full mouth-feel, intense floral aroma, and a long-lasting aftertaste that is refreshing and sometimes even buttery, depending on the level of oxidation and baking.